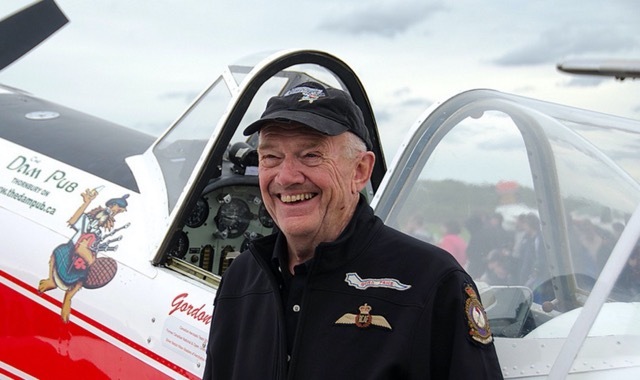 At age 77, Gord’s hope is to promote aviation and inspire young people to enter a career in aviation. He would also like to inspire those pilots who are advancing in age to continue to fly. To do this in the summer of 2019 Gord is planning a Canadian Nationwide Airshow tour sponsored by The Dam Pub Thornbury. Gord’s aerobatic display is tight, right in front of you, fast moving and graceful with the largest airplane ever used in World Aerobatic Championships. The YAK 50 Prototype (serial number 01) was hand built at the Yakovlev Design Bureau in Moscow and first flew in June of 1972, 3 years before any of the 312 production aircraft. Gord is available for all pre-show publicity and loves to mingle with the crowd after the performance, if at all possible. Contact Gord for show requirements and contract details. Dates now available in for 2019 shows within across Canada. Your airshow is probably eligible for one of our ‘DAM PUB’ sponsorship packages.